"Hmm... maybe but we can only assume cause we weren't here and i think there weren't any survivors.. But i'm not so sure about the leopard there was something off about it.." she said, thinking about the blood on the paper. Despite himself, Luxord felt something didn't fit right with this puzzle, there were people here, then they simply vanished, and now this....there had to be another clue somewhere. Without realizing it, Luxord was staring off into space and was oblivious to the fact that they were being stalked. a few minutes later however he came back to the present "I think the connectioon is in the leapard itself, any real animal wouldn't attack a human...or in our case right now, Nobodies unless they were desperate"
Sayuri nodded and looked at Luxord. "Yeah, that's true most animals leave humans alone unless the humans bother them.. she said feeling as though they were being watched. She knew something wasn't right in that house but she didn't know what. "Yeah, i feel like we're not alone in here...." she said turning around. She looked toward the shadows in the back of the house. "Who's there?" she asked, seeing a pair of yellow eyes now looking at her and Luxord. Is the leopard back? she thought taking out her keyblade. Luxord got into his battle stance, which was just crossed arms holding his cards in his fingers "Its a Powerwild by the look of it and how it seems to be moving, go get im girl" he watched her take off "This should be rather interesting, lets see what she can do"
Sayuri ran at the Powerwild, her keyblade already in her hands. She gripped it tightly and jumped to hit the heartless. She jumped back and out of the way of the Powerwild's counter attack. She threw fireballs at it and hit it with her keyblade causing extra damage since the heartless was now on fire. Sayuri allowed her keyblade to disappear out of her hands and she looked up at Luxord. She frowned a bit at what he said but she nodded, knowing he was right. "Sorry. Guess I forgot." she said dryly. "Can we move on now?" she asked him. For some reason she was eager to get going. Something was telling her that something had was going to happen soon and she didn't want to be there for that. He checked the area one last time for anything unuasual then gestured to a nearby window. "Shall we then?" Sayuri was really getting a bad feeling about being in this place. She wasn't sure if it was just in this small area or if it was just the jungle in general. But one thing was for sure, she felt like something was following them, and it was something strong. "Right." she said in a weary and slightly frightened tone, as she walked toward the window Luxord had gestured toward. Sayuri followed Luxord out and looked out at the jungle. It was a huge place and she wondered how long it would take to do reconcile on the entire place. "Should we split up? Or just do recon by sections?" she asked him. 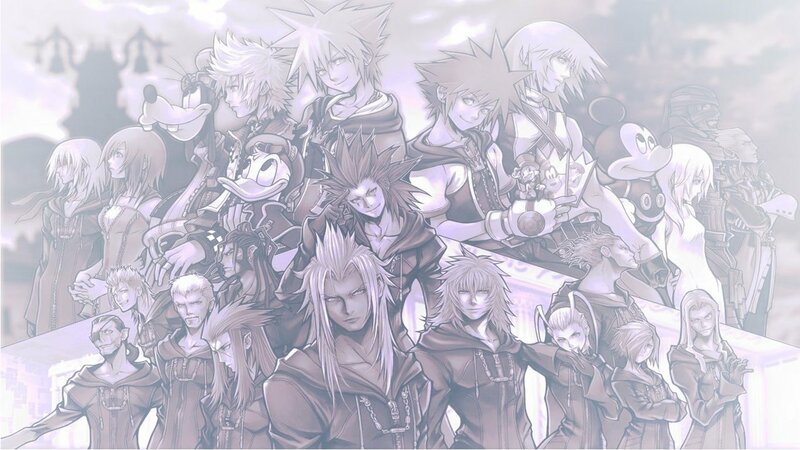 "A place like this we'll more than likely get lost or picked off by some abomination of a Heartless, it would be wise to stay together. We'll start by investigating that." He pointed at a small column of smoke rising in the distance. Sayuri blinked and looked off in the direction where Luxord was pointing and she shrugged a bit. "Hmm. Maybe the locals?" she questioned, mostly to herself. It was possible that someone who lived around there was making that. Either that or a heartless was causing trouble over there. Sayuri pursed her lips slightly and tilted her head as she looked at the smoke rising. "Right." she nodded and began to follow Luxord down the path he was taking. It took a little while, but eventually the pair made it to the smoke, which revealed to be a campsite of some sort. "It appears deserted, but that never means theres nothing of interest" he said to Sayuri and as if on cue six Powerwilds, two Sniperwilds and a Bouncywild appeared to bar their path. "I don't think it's been deserted for very long. Since the smoke is recent, it seems like whoever was here just left. Either that or something happened to them" she said. Sayuri only blinked when the heartless appeared before she shook her head slightly and she summoned her keyblade. He started the battle by charging the Powerwilds but then leaped over to deal with the Sniperwilds, the Bouncywild managed to get to a better distance before pulling back on it's slingshot. A card combo eliminated one Sniperwild, Luxord then used blizzard on the other which dodged to the side just in time. Sayuri watched Luxord begin the battle, and saw him destroy one of the heartless. She knew she should be the one to start it and be destroying the heartless, since she's supposed to be collecting hearts no matter what. But she hadn't even moved from her position for some reason. It was like an invisible force was keeping her feet planted in the spot where they were. As she saw one of the Sniperwilds move out of the way of Luxord's attack and as if on cue, Sayuri lifted her keyblade and she ran at the heartless. She gave it two swift hits and it was destroyed. Then she moved on to the others. Luxord knew something was bothering his companion by now, she should have started th fight. But what was really bothering her? it'll have to wait "Take hte Powerwilds, i'll take care of the Bouncywild" he told Sayuri before leaping after the bouncy heartless. Her head began to hurt as if had many times when she was near Akiharo. This didn't make sense though, she wasn't anywhere near him, right? It had to be the Jungle, a memory from it must be trying to get to her. But she couldn't let it take control of her now, there were still some heartless and if she let the memory in now, it would leave her wide open for the heartless to attack her. Instead she nodded after Luxord told her something and she ran at the Powerwilds.